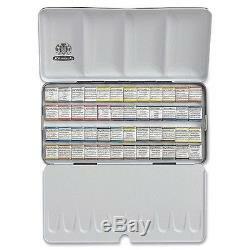 PRODUCT : SCHMINCKE HORADAM ARTISTS WATERCOLOUR - 48 HALF PAN - METAL BOX. DESCRIPTION : Horadam Aquarell finest artist's watercolors are formulated with one pigment only, the ideal concept for professional painting and for color mixing. Many of the new artists' pigments have been researched and tested to comply with the highest quality standard regarding stability, fineness, re-usability and light fastness. To achieve the outstanding characteristics, like reusable paint when dried on a palette and the high control of paint flow, even on soft watercolor papers, only the best raw materials are used. In its coloristic appearance, the total assortment is particularly harmonious, balanced and complete. This Scminicke Horadam Aquarell Slimline metal box set features 47 half pans of watercolor including Lemon Yellow, Cadmium Yellow Light, Cadmium Red Light, Permanent Carmine, Ultramarine Finest, Prussian Blue, Phthalo Green, Permanent Green Olive, Yellow Ochre, English Venetian Red, Chrome Yellow Deep, Chrome Orange, Deep Red, Magenta, Manganese Violet, Indigo, Cerulean Blue, Helio Turquoise, May Green, Cobalt Green Dark, Naples Yellow, Burnt Sienna, Sephia Brown, Translucent Yellow, Translucent Orange, Scarlet Red, Ultramarine Violet, Delft Blue, Mountain Blue, Prussian Green, Olive Green Yellowish, Jaune Brilliant Dark, Madder Brown, Burnt Umber, Indian Red, Gold, Silver, Indian Yellow, Madder Red Dark, Cobalt Turquoise, Naples Yellow Reddish, Titanium Opaque White, Permanent Chinese White, Neutral Tint, Paynes Grey Bluish, Phthalo Blue and Ivory Black plus ONETZ. ABOUT US : Bargainartistshop is the online sales name of The Paper House, Stafford. Established in 1984, we aim to offer premium brands at bargain prices. All our products are new and unused. We operate from our own modern site with a showroom and 9000 square foot warehouse. It is located five minutes from M6, jct 14. We can be contacted by telephone on 01785 212953. This does not include weekends and bank holidays. This time may increase during the run up to Christmas and during other busy periods. DELIVERIES NOT RECEIVED : If your order has been despatched but has not arrived in the time stated, we request that you check with your local sorting office. Our statatistics show that 95% of missing parcels turn up this way! Please follow the instructions on the card to arrange redelivery or collection. The item "Schmincke Horadam Artists Watercolour 48 Half Pan Metal Box Set 74448097" is in sale since Sunday, March 09, 2014. This item is in the category "Crafts\Art Supplies\Painting Supplies\Paint\Watercolour Paint". The seller is "bargainartistshop" and is located in Stafford, Staffordshire.